Tomorrow, Donald Trump will be sworn in as the 45th president (as you’ve probably heard). As part of the ceremony, he’ll swear on the Bible—in this case, two Bibles. The president-elect announced earlier this week that he plans to use his own Bible in addition to the same Bible used by Abraham Lincoln during his first inauguration in March of 1861. The significance of Lincoln’s Bible speaks for itself. As for Trump’s own Bible, it’s a Revised Standard Version he says his mother gave him when he graduated from Sunday school back in 1955. Swearing on a Bible is a presidential inauguration tradition that goes back to George Washington. But not all presidents have chosen to swear on the Bible: Theodore Roosevelt, John Quincy Adams and Lydon B. Johnson are among those who didn’t use a Bible in their inauguration ceremonies. 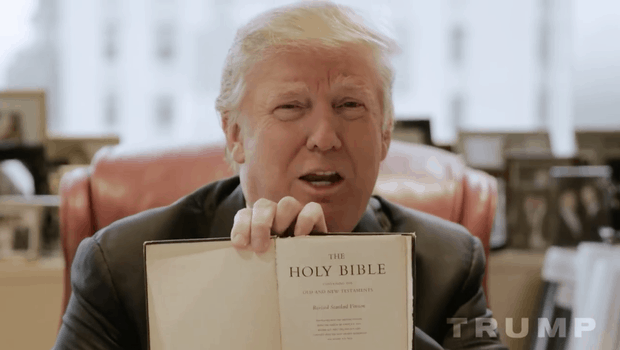 Trump will be the fifth president, including Barack Obama, to swear on two Bibles. Supreme Court Chief Justice John Roberts will conduct the ceremony.